When the Boston Committee of Safety learned of the British plan to destroy American ammunition stored at Concord, it sent Paul Revere and William Dawes to alert the countryside and gather the informal volunteer militia known as the Minute Men. On April 19, the Minute Men and British troops met at Lexington, where a shot from a stray British gun led to more British firing. The Americans only fired a few shots, but several of their soldiers were killed. 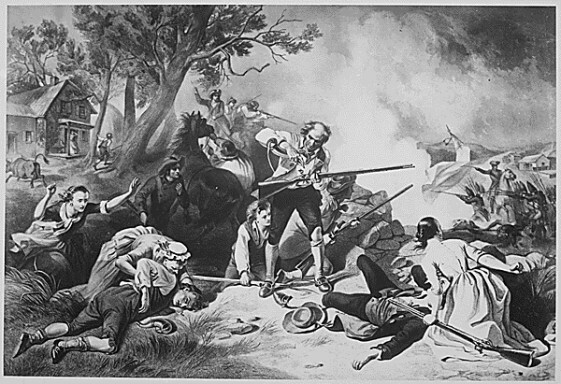 The British marched on to Concord and destroyed some ammunition, but soon found themselves under increasing fire from local riflemen. In May, Benedict Arnold led colonial militia which captured Fort Ticonderoga in New York. The early clashes sparked growing support in the colonies for a formal split from Great Britain. 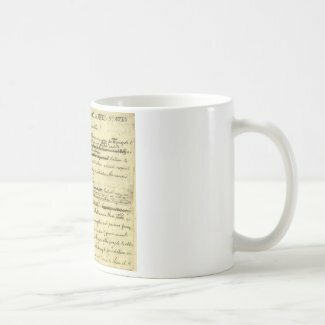 The themes and much of the language of the Virginia Declaration of Rights were echoed in the drafting of the Declaration of Independence adopted less than a month later by the Continental Congress. Following the skirmishes in Massachusetts at Lexington and Concord in April 1775, more organized engagements took place, with the Americans under Benedict Arnold seizing Fort Ticonderoga in New York in May and the British gaining a costly victory at Bunker Hill in Boston in June. In July, George Washington arrived in Massachusetts to formally assume command of the new Continental Army. The American invasion of Canada launched in September ended with defeat on December 31 in the Battle of Quebec. In June 1775, the Congress established the Continental Army as well as a continental currency. In August, a royal proclamation declared that the King George's American subjects were "engaged in open and avowed rebellion." In March 1776, General Washington forced the British out of Boston with siege guns moved from Fort Ticonderoga, and then pursued the British as they moved their forces to New York. ﻿In the following June, Virginia delegate Richard Henry Lee offered the Congress convened in Philadelphia the resolution that "these United Colonies are, and of right ought to be free and independent States." Taking up Lee's resolution, Congress appointed a committee to compose the colonies' list of grievances to King George. Committee member Thomas Jefferson wrote the Declaration of Independence during early summer 1776 in his rented Philadelphia rooms, with Jefferson's first draft edited by John Adams, Benjamin Franklin, Roger Sherman and Robert Livingston. The draft was then presented before the Congress on June 28, which after debate made 39 revisions to the draft, adopting the Declaration on July 4th. Congress also authorized the document's printing and distribution to the colonial legislatures and armies in the field. In New York City, revelers pulled down the statue of George III, and subsequently melted the statue into several thousand lead balls for Continental army muskets. Hostilities would continue, with perhaps the low point of colonial resistance reached in the 1777-78 winter encampment of the Continental Army at Valley Forge in Pennsylvania. But while Washington's soldiers were completing their stay at Valley Forge in February 1778, the Treaty of Alliance between France and the United States was concluded at Paris and later ratified by Congress in May 1778. The treaty provided for a defensive alliance to aid France should England attack, and that neither France nor the United States would make peace with England until the independence of the United States was recognized. The French alliance helped end the war when Washington, advancing from the north, combined with a French army to the south to assemble 16,000 troops confronting a British force of only 7,000 under the command of Lord Charles Cornwallis at Yorktown, Virginia. Before the Royal Navy could arrive to evacuate the British force by sea, the French fleet sailed into position to block any rescue attempt. On October 19, 1781, Cornwallis surrendered his entire command, the largest British army in America. The victory at Yorktown effectively ended major hostilities, but a formal peace was not reached until the Treaty of Paris was signed on September 3, 1783 and ratified by the Continental Congress on January 14, 1784. The new treaty recognized the colonies independence from British rule; confirmed American territorial claims up to the Mississippi; acknowledged the pre-War colonial debt colonial to British citizens; and guaranteed that former Loyalists would not be persecuted.